What you need to truly get a party started, regardless of the event, is the best music and the best atmosphere available. We are AK Musik and our DJ, Arun Kalyun, can deliver just that and guarantee you the event of a lifetime. Playing a variety of music, all delivered with a cutting-edge sound system, we guarantee that you will be on your feet and dancing as long as he’s playing. Bollywood films are extremely popular all over the world. The song-and-dance routines, performed to a backdrop of beautiful and often energetic music, are central parts of the films, and it’s their unique musical style which draws in fans from across the globe. It’s this kind of popular music which can get everyone up and dancing at any type of event. The style combines traditional Indian and Pakistani music with the styles and instruments of Western music which transcends cultural barriers and provides a style of music that appeals to many people. That’s why Arun is a Bollywood DJ, playing this popular music to get the crowd on their feet and feeling the energy. This fantastic music is played through a cutting-edge digital sound system which can deliver crystal clear sound to over a thousand guests. The skills and expertise of Arun, a well-known DJ with international experience, will ensure that the best music is played. With a huge song catalogue, you can rest assured that he will find the best songs to play that everyone will enjoy. We can guarantee that you will be dancing as the event kicks off, and that’s why it’s a smart choice to hire Arun and AK Musik for your event. Whether a corporate event, dinner and a dance, or even a wedding, we offer a personalised experience that cannot be matched. We offer five packages, from bronze to the extreme LED platinum plus package. These packages offer a wide variety of amenities that can truly transform your event. From items such as smoke machines and light shows, to starcloth and Dhol players, up to and including haze machines, plasma booths and LED split screens. We can even offer Western, Bhangra or Hindi dancers to add that true touch of Bollywood to the event. We can provide LED dancefloors in black or white and we also offer LED walls and curtains which can surround the event and deliver an awe-inspiring visual experience that will be simply unforgettable. 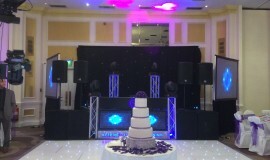 Our Bollywood DJ is always open for bookings, regardless of the event that you want to hire us for. If you have any enquiries, or wish to make booking, then please call us today on 07985105182. Alternatively, we can be reached via e-mail at info@akmusik.co.uk. AK MUSIK is highly experienced in the Entertainment and Music industry and constantly delivers powerful, classy, dynamic and crowd pleasing experiences globally. © 2019 AK MUSIK. All Rights Reserved.